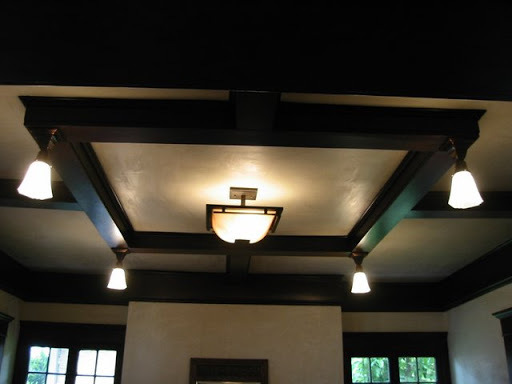 The 1913 Craftsman-bungalow Cesar Sanchez has been restoring over three years is not perfect, and that’s the way he likes it. The refinished wood columns in the living room still bear a deep gash from a previous resident’s ill-fated attempt at remodeling. 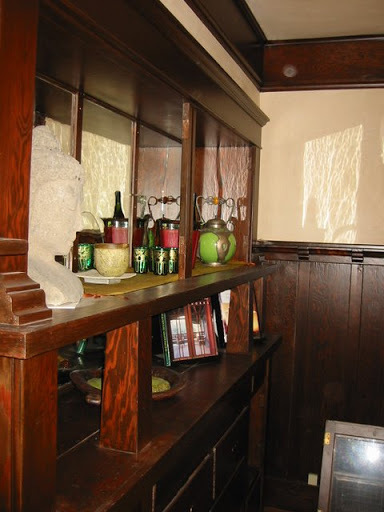 In the dining room, the original mirror in the built-in china cabinet is cracked . A doorway in kitchen sags slightly, evidence of a foundation that has settled over nearly a century. Cesar could have had the damaged columns and mirror replaced with new versions and the door way fitted with a new molding. But in Cesar’s view, these imperfections are part of what gives the brown and tan bungalow on Alvarado Street its historic character and personality. It’s part of the home’s history. The bungalow is one of five nearly century-old homes that Cesar, his sister, Alina Sanchez, and, father, Cesar Sanchez, Sr., have restored on Alvarado between Montana and Scott avenues. This cluster of homes have created a mini-historic district along what is a busy stretch of road across the street from a Rite-Aid drug store. Cesar’s house, which he used as an office before recently renting out, was the last to be restored and in the worst shape. It certainly tested the experience that Cesar and his family had gained in restoring other old houses in Silver Lake and Echo Park. For starters, the foundation was so badly damaged that part of the housing was leaning. The plaster walls inside were badly cracked and new walls had been built to cut the house up into small rooms and separate living spaces. The plumbing and electrical wiring had not been updated in decades and there was extensive wood rot in the kitchen and bathroom, which would have to be gutted. Then there was the porch. 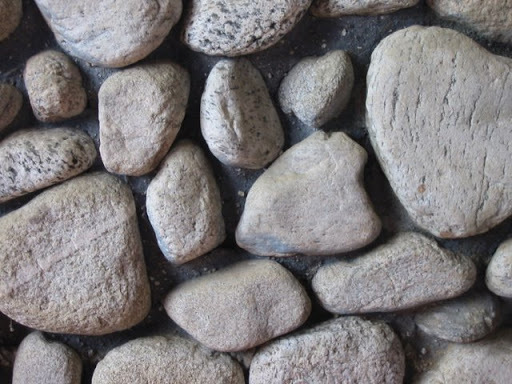 The river rocks and boulders that once gave it a rustic charm were still there but had been painted over with a coat of blue that Cesar said reminded him of Downy fabric softener. “It was on its last legs,” Cesar said of his most recent project. It may have looked like a tear down to most owners but Cesar saw plenty of potential beneath layers of paint and grime. 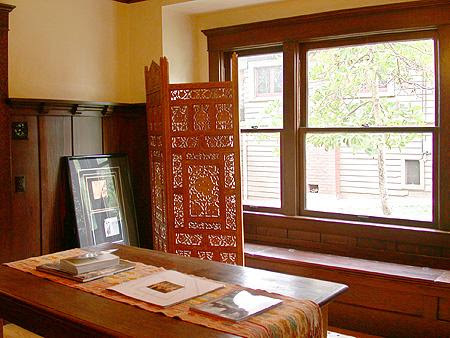 Most of the original door and windows moldings remained as did a sliding pocket door, beamed ceilings, built-in china cabinets and benches and wainscoting. The exterior wood was in good shape and covered in its natural stain. The cozy home had a nice floor plan and the den and living room created a large space in front. Despite heavy traffic on Alvarado, the house was quiet inside. 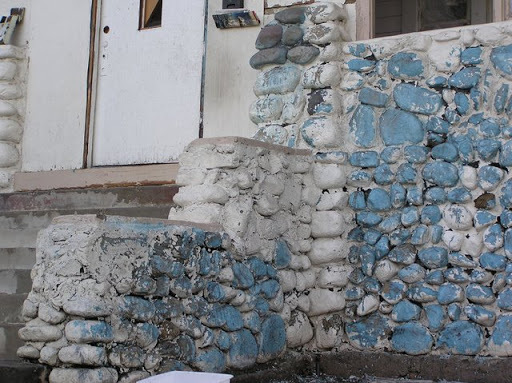 The river rock front porch was covered in multiple layers of paint. Cesar tried paint removers but then had to to sand blast. The ceiling beams were still there but also covered in paint. After the paint had been stripped away and new fixtures installed. More gleaming wood after being stained a dark color. 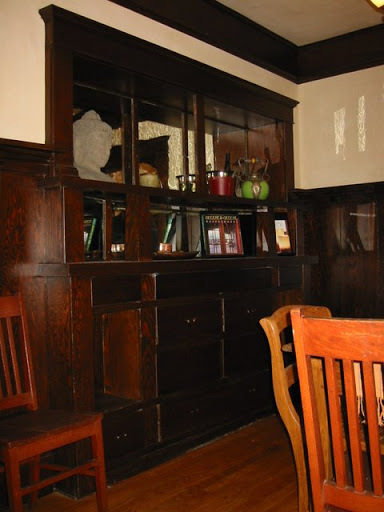 At least the built-in, dining room cabinet had not been ripped out. The same cabinet after being stripped and restained. 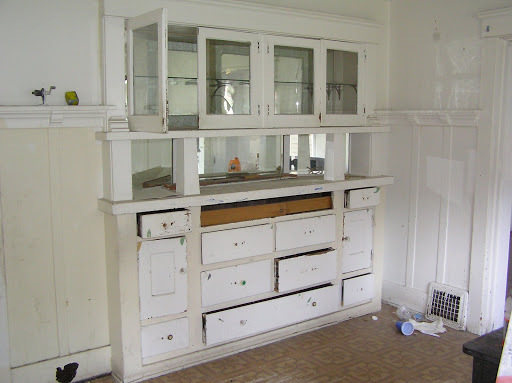 The cabinet still has the original, mirrored interior. The orignal plaster walls, which were badly cracked, were redone. Look at those walls and wainscoating now. 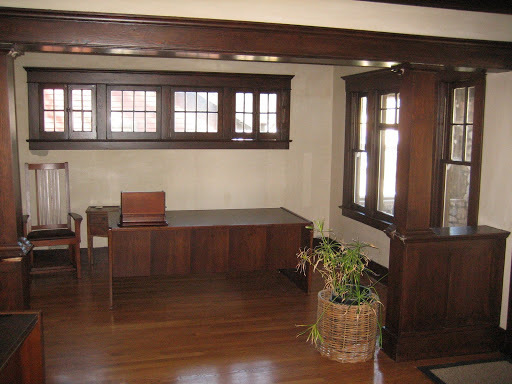 Large, original wood windows let in a lot of light. 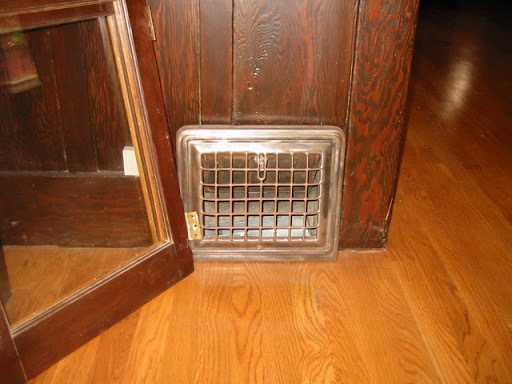 Many of the original fixtures, including this heating vent, were saved. 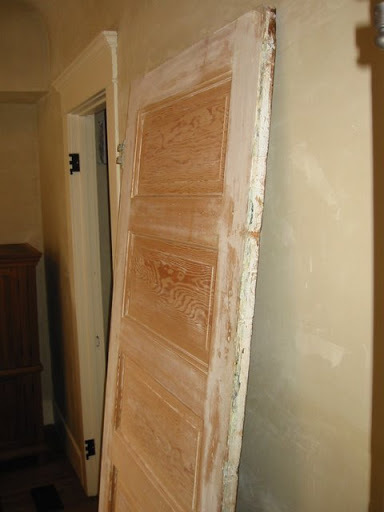 The original wood doors were sanded down and re stained as well. 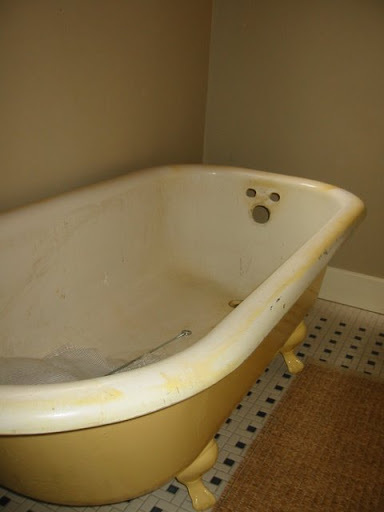 This salvaged claw foot tub awaits refinishing and fixtures. A new pedestal sink and tile floor in the bathroom. The result: a rustic reminder of Echo Park's past. Where to start? Instead of focusing on aesthetic improvements, Cesar instead worked on taking care of the basics. In this case that meant fixing the foundation to stabilize the house, installing new electrical and plumbing systems and repairing the roof. A new coat of paint first off would have made for a dramatic change and a quick psychic payoff but was not practical. “It would have been a waste to spend all that money” if the foundation shifted or the roof leaked, he said. 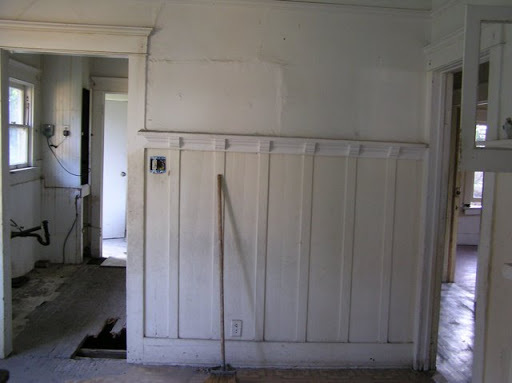 Inside, Cesar and his workers turned his attention to stripping layer after layer of paint from Douglas fir moldings, built-in cabinets and wainscoting (wood paneling that covers only the lower portion of a wall). 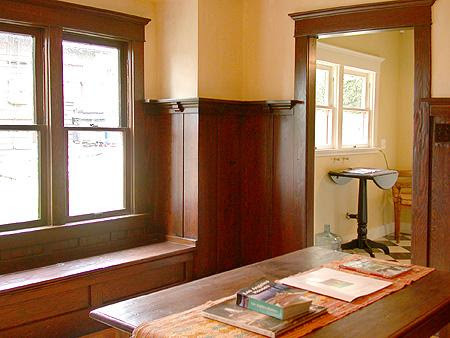 Stripping wood is perhaps what can make restoring Craftsman-style home an expensive undertaking. “A craftsman is more expensive because there is more woodwork to strip, paint and stain,” he said. The wood was stripped down to the original dark, reddish brown stain, which Cesar reproduced as closely as he could and applied to other wood surfaces. The result is that rich, dark ribbons of wood now flow through nearly every room in the house. “It’s the color that united the whole house,” he said. 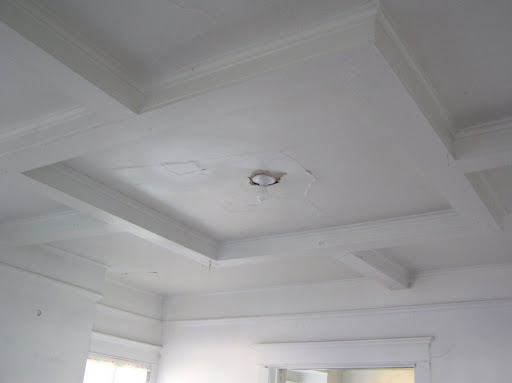 The old plaster walls were so badly cracked and damaged that they could not be patched. The most common solution here is to replace the plaster with inexpensive wall-board but he opted instead to hire an expert in plaster walls. This was a more expensive option than drywall but he said that plaster walls have a unique texture and look that dry wall cannot match. Cesar mixed in a colored tint to the plaster, eliminating the cost and time needed to prepare, prime and paint the walls. Indeed, the walls glow softly and are marked with the faint swirls left behind by a trowel. That’s OK with Cesar because it reveals the process behind building the home and reflects the Craftsman tradition of using natural materials. 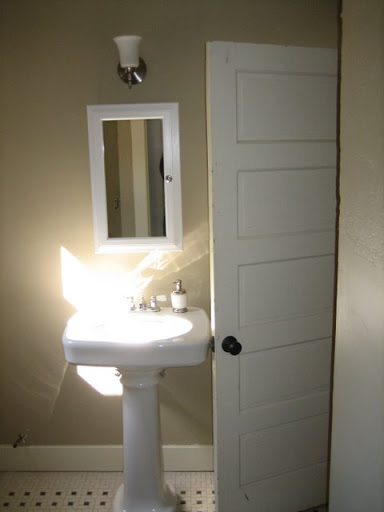 He tried to clean up as many of the original fixtures as possible, from door locks to metal heating vent duct covers. He also searched for salvage pieces, such as doors, and selected new pieces that complemented the surroundings. The new chandelier in the dining room, for example, has a rustic, metal finish in keeping with the Craftsman style. Home renovations notoriously run over budget and time, but Cesar was able to enjoy a few surprises that saved some money. He remembers removing large sheets of plywood from the living room wall and hoping the wood windows would still be there. They were, large picture windows with the original wavy glass, and double-hung windows with weights (which help lift the windows up and down) still attached. But perhaps one of the most daunting and frustrating challenges that awaited Cesar was out front and in full view-the Downy blue river rock porch. The trick was to remove layers of paint without marring the rock surface. He tried gallons of Jasco (a powerful paint remover) and armed himself with brushes to scrub off the blue. It was a time consuming and costly and the results were far from pleasing-the paint had penetrated into the unreachable pores of the rock. 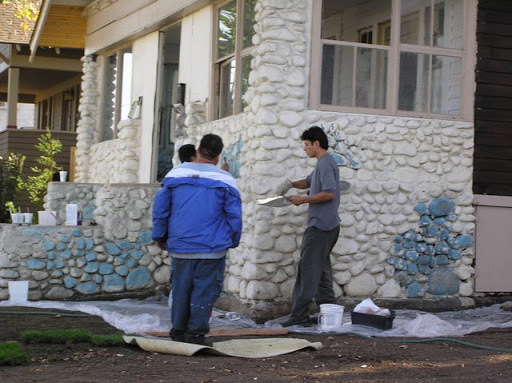 Sandblasting, Cesar knew, would get the paint out but it would also pit the surface of the rock and loosen the mortar. He looked into using a high-pressured stream of crushed walnuts (which is less abrasive than sandblasting) to remove paint. But after several failed attempts to contact and hire an expert in this technique, Cesar reluctantly decided to sandblast to finish the job. The sandblasting did remove the paint, along with some of the mortar and rocks, leaving Cesar to literally pick up the missing pieces. “I had to go in and choose my favorite rocks to fill in the empty spaces,” he said. It’s not what Cesar has planned. But these types of compromises and set backs are common for those who have renovated old houses. But, as a whole, Cesar’s ongoing restoration of the house has proved rewarding. 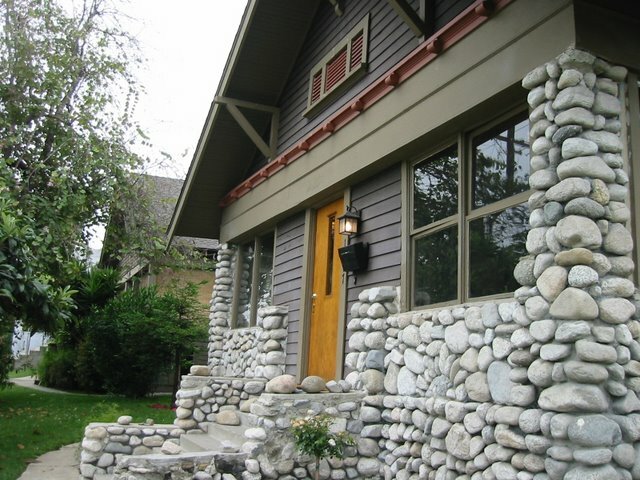 That river rock porch, once an eyesore, is now a welcoming and rustic reminder of a previous era. “The main thing that I wanted to do was to restore it to the true spirit of the house and reflect the original intentions of its builders,” Cesar said. This story appeared in the Summer 2007 issue of the EPHS News.